Employers are welcome to submit postings for the CAGC job board and/or email broadcast requests here. If you are choosing the email broadcast option only (no job board posting), simply enter "Emailing PDF to CAGC Office" in the summary section of the form and then email the PDF to cagcoffice@cagc-accg.ca. 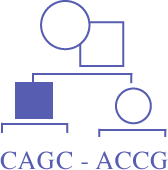 Once submitted and approved by the CAGC Membership Committee, job postings will be distributed accordingly and a notice of distribution sent to the submitter. Job Postings are available to all CAGC members. To view the CAGC job board simply log into your member account.